Using text messages as one of the ways to communicate is a smart thing to do as your entire target group has a smart phone. So what message do you send to your customers? Research shows that messages conveying a sense of urgency have the opposite effect from the one intended during Black Friday & Cyber Monday. "Quick before it's too late! ", "Only available for a limited time..." or "Hurry..." do not really yield the desired results. This is because everybody else approaches the customer with a sense of urgency during Black Friday and Cyber Monday, so your message is nothing new and gets lost in the myriad of companies trying to vie for the attention of your customers. So what should you say? Below we give you 7 tips from our marketing and psychology experts. Black Friday is becoming an increasingly popular time to buy. 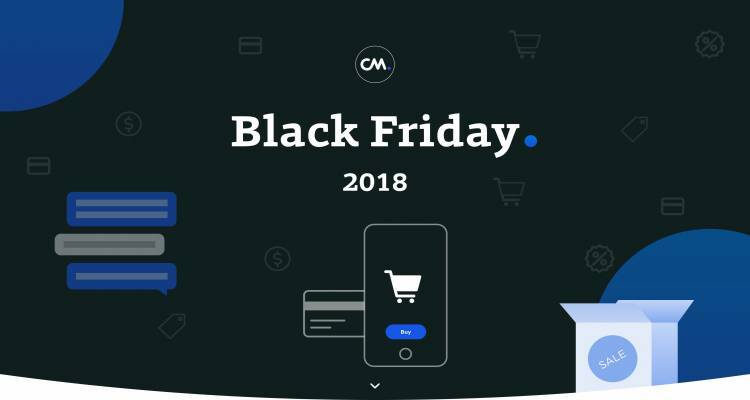 Many of your competitors will be very active during Black Friday, so it is important to not only tell people about the huge savings but also to tailor the message to your customer. A relevant message will encourage him/her to take action. Make your customer aware of the coming festive season and emphasize how Black Friday is the perfect time to get a discount on presents. Give your message a special Christmas theme. The response rate for messages with emotion increases by 60%. Moreover, research shows that buying presents for others is more rewarding than buying presents for yourself. Now the holiday season is coming up, it may be a good idea to remind your customers of this with a marketing message. Add some Christmas spirit to your message: "Giving makes you happy. Buy your Christmas presents from [your company] and get 25% discount!” A combination of a reminder to buy presents and an emphasis on the relevance of your message will increase the likelihood that your customer will buy from you. Mention your personal relationship with the customer. A text message will feel a lot more personal to your customer than an email, for example. Use that knowledge and ensure that your communications always have that personal touch. Emphasize how important your customers are to you and that you would like to reward them for their loyalty. For example, you could emphasize that loyal customers are given an additional discount compared to customers who only buy from you once every three years or so: "As one of our loyal customers, we will give you an additional 20% discount this weekend." By reminding your customer of their loyalty and rewarding them, they will be happy to reciprocate and this can make the difference as to whether they decide to buy from you or the competition. In tip 4 we gave the following example: “Don't miss out on this special discount, check our special offer here.” This example plays on people's fear of missing out, which is also known as loss aversion. This fear will prompt them to take action in order to prevent this. The following is a good example: “The 100 euro you had yesterday will be worth 150 euro this weekend.” The advantage for the customer is clear: he/she spends less, but gains more. This message also makes clear what they will lose out on if they do not take up the offer. If you present your message in this way, you take the customer out of their usual way of thinking (tip 4). If the offer is valid for a limited time only, customers will know what to expect and realise that this offer will not always be available (tip 6). This will prompt them to take action. “You've still got lots of time to take us up on this special offer, i.e. until this evening." All the previous tips show a sense of urgency, even though we mentioned earlier that this is not always the best approach. Although in some cases it can work to your advantage. The main thing to remember is to use this in a different way to your competitors. For most other companies, this is the main point in their message. Using a sense of urgency in combination with the tips in this article is the best approach. It is more effective to create a sense of urgency in a different way than we are used to: “You've still got lots of time to take us up on this special offer, i.e. until this evening." The first part of this sentence is not something you would expect in an offer with a time limit. The second part negates the first part, creating a sense of urgency after all, without making this obvious. Sometimes your message may exceed 160 characters. In that case, it is best to add a link to a mobile landing page. Arouse your customer's interest with a text message and tell them more on the mobile landing page. This way you can reach your customer in a personal and unique way and still be able to tell them more than in your 160 character text message. Black Friday and Cyber Monday have become a permanent fixture in the Netherlands and will become more popular in the future. Distinguish yourself from the start of the customer journey with both your messages and your style of communication. Text messages are the ideal medium for this in a world which is increasingly connected. Text messaging provides more opportunities than you may think. Click here for more options or create a demo account to start testing your text messaging campaign. Roser-Renouf, C. (1990). Involvement, attention, and perceptions of message relevance in the response to persuasive appeals. Communication Research, 17(5). Dunn, E. W., Aknin, L. B., & Norton, M. I. (2008). Spending money on others promotes happiness. Science, 319(5870). Davis, B. P., & Knowles, E. S. (1999). A disrupt-then-reframe technique of social influence. Journal of Personality and Social Psychology, 76(2). Tversky, A., & Kahneman, D. (1991). Loss aversion in riskless choice: A reference-dependent model. The Quarterly Journal of Economics, 106(4). Swain, S. D., Hanna, R., & Abendroth, L. J. (2006). How time restrictions work: The roles of urgency, anticipated regret, and deal evaluations. Advances in Consumer Research, 33.